Our bodies are now resting as we focus this week on limited workouts with solid form. As we turn down the volume on our physical part of this season's journey, we're focusing on turning up the volume on the fundraising end of this season's goals. Won't you join us? Remember: Your contribution to Genesis Home through the Tri to End Homelessness Campaign will be matched by a local foundation! Just as we've tried to make this triathlon season meaningful for us by training and competing in solidarity with the Genesis Home families, you can make any contribution that is meaningful for you. For triathletes that might mean: A $5 donation to Genesis Home instead of purchasing that special cup of coffee that gets you going before your morning workout. Perhaps it's $13.10 in honor of the half-marathon you'll be completing later this season. Perhaps it's $50 in exchange for the new tri shorts were going to purchase this month. Perhaps it's $140.60 in celebration of your Ironman status. Regardless of the amount -- know that it will make a difference. The film documents a dance movement among young people in South Central Los Angeles -- but the story is one that most of us non-elite athletes can relate to -- faith that transformation lies in the power of our own two feet. We become what we choose to become. That resilience is our prayer for the families of Genesis Home . After Robyn had the swim of her life on Monday, a few of our other workouts this week have proved to not be quite so inspiring. On Tuesday, Rachel witnessed two loud and obnoxious arguments - one between neighbors, one between parents of a small child - during her warmup run and then slogged a bit through strides. On Wednesday, Robyn huffed and puffed through a seemingly low-key swim and began to wonder if indeed Monday's progress was real. And throughout the week, we've both felt just a little extra tired. All of this reminds us of why we're incorporating yoga into this season's training. Our coach, Sage, is also our yoga teacher. During this week's class, we focused on santosha or contentment -- one of the niyamas or fundamental principles of yoga -- and an important part of our endurance training. Contentment with our bodies -- just as they are, today. Contentment with our workout -- even if it didn't go as planned. Contentment with our lives -- even when they are complicated and messy. So with this in mind, we're embracing the long workouts ahead this weekend - content to accept the challenges they pose and ourselves - just as we are. Nobody likes to think about or talk about taxes -- especially during this pre-April 15 time of year. 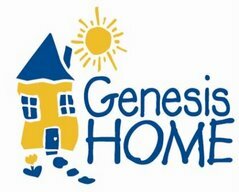 However, we're glad to know that some of our federal taxes are being put to work in supporting Genesis Home. Yesterday, the federal government awarded $1.4 billion in grants to support 5,300 local homeless programs. One of those local programs is right in our neighborhood -- helping families with children who have no where else to go. We agree with Housing and Urban Development Secretary Alphonso Jackson: "Whether it's a single man living with a mental illness or a family struggling to give their children a roof over their heads, this funding is quite literally saving lives." Today, I became a swimmer. Today, I remembered that baby steps really do add up. Today, I learned again that putting one foot, one arm, one kick in front of the other really will get me to the end. Today, I know that action will transform me, give me wings, and change my life...again and again and again. This morning I swam 1850 yards as part of my olympic distance training. Not long for some, but long for me. Long and strong -- not panting, gulping for air. Long and strong -- reaching with sure, refined strokes. Long and strong - knowing that I could do it, knowing that the power is within me...just waiting to be released. My long time best friend and I chatted on the phone last night about faith and progress. In the midst of the Montana winter, she's training for her second 5K -- one sure step at a time. She reminded me that only 5 years ago, I couldn't run for 5 straight minutes on the treadmill -- and this weekend, I ran for over an hour mostly just for fun. I had faith then that I could complete a 5k, then a 10k, then a half-marathon, then a full 26.2....and I have faith now that I will indeed get through my first olympic distance tri swim. One true stroke. I can do this. One true step. The families of Genesis Home can achieve their goals too. According to the annual Point in Time count released yesterday, homelessness in the Triangle has increased. The 2007 count showed 1,806 homeless men, women, and children living in Durham, Orange, and Wake counties. That's up from 1,720 in 2006 - and doesn't include folks who may be sleeping on a friend's couch or temporarily staying with a family member. "On this day when we can't help but ponder the meaning of love, let's try to take the great bond of love common to all humanity and seek a deeper, more meaningful expression of that love, an expression that take us us beyond Valentine's, roses, and teddy bears. Let's try to exude love in how we treat each other. " On this day we're thankful for the love we have in our lives, the strength of our bodies, the warmth of our homes. We hope you are too. Triathlon training provides us with a lot of time for reflection. Sometimes, during the early morning hours, we're simply focused on remembering what the swim set for the day is and what number lap we're on. Sometimes, we're going through the day's to-do list, mapping out which life/work/school/house/husband/family/training strategy will enable us to get through the week. And, then sometimes, we actually stumble across lessons that have implications far beyond our next race. Coach Sage's training plan has helped us mine one of those gems: Surprisingly enough, nothing changes unless we do. We don't get faster just by running more mileage, swimming harder, or adding minutes to our Saturday bike ride. We don't increase our mental toughness just by thinking about the race ahead. We don't build endurance by simply wishing we had it. As simple as it now seems, these things requires that us to actually change. Change our pace, change our distance, change our rest, change our intervals, change our food, change our attitude, change our lives. Similarly, the homeless families currently living at Genesis Home won't find a way out of poverty simply by wishing it so. They won't get that job that pays a living wage by just applying for more jobs. They won't learn the skills they need to lead happy, healthy, and successful lives by thinking about going back to school. And, although many of them, have survived systematic injustice, their lives won't improve while they complain about the system. Instead, they also have to change -- and Genesis Home helps them do that in the same way that Sage is helping us: providing structure, doling out encouragement, and holding us accountable. Today, our local paper highlights the volunteer tutoring services that students from NC Central University are providing to students at Hillside High School. Both of these schools share Genesis Home's neighborhood. In the story , NC Central student Geoffrey Cooper says, "You don't have to be a millionaire. You don't have to be a philanthropist. You don't have to be a world-class educator....It's not about the title you hold. It's about the role you play." You don't have to be a millionaire. You can help can help end homelessness with just a small amount of money. You don't have to be a world-class athlete. You can achieve beyond your wildest dreams by simply putting one foot in front of the other. You don't have to do any of this on your own. You can join us in the journey. It's not about the title you hold. It's about the role you play. So what does triathlon have to do with homelessness? Well, as Chris Gardner said, "Baby steps count, but you've always got to be moving forward." Chris Gardner was once a homeless, single dad living in Oakland's shelters and cheap hotels, trying to take the steps necessary to move himself and his young son out of poverty. Today he is a highly successful stockbroker and the owner and CEO of Christopher Gardner International Holdings with offices in New York, Chicago, and San Francisco. You may have seen his inspirational story at a theater near you. Committing to our goal, even if we're unsure of how the story will end. Looking forward and planning ahead -- making a schedule for the week, setting our multitude of work / training / school gear out the night before, making meals ahead of time -- in order to anticipate and hopefully avoid barriers. Getting up every morning and doing what it takes to stay on track with that goal, even when the snooze alarm's siren song is calling. Negotiating time for training with our families and engaging them in the process of achieving our goal. Understanding that setbacks are simply part of the journey - and not a reason to give up. Like Chris Gardner and the Genesis Home families, we're pursuing our dreams, our version of happiness -- a life where we're at our best physically, mentally, spiritually -- for ourselves, our families, and our communities. Triathlon helps us get there. And this year, we're doing it in solidarity with those homeless families in Durham who are simply pursing their own happiness -- lives of stability, dignity, and hope. We hope you'll join us and them by supporting our efforts. All donations to Genesis Home through this campaign will be matched by a local foundation. We hear you friends and family...and Genesis Home does too! Thanks to your speedy generosity, we've raised $130 to end homelessness in the past 3 days! 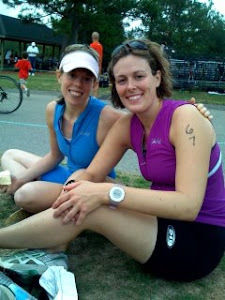 We're on our way to meeting our goal of raising $2500 by the time of our first 2007 triathlon on April 14. Remember: all gifts to Genesis Home between now and June will be matched! 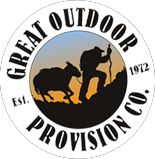 We've also received an incredibly generous gift from our first sponsor! Sage Endurance has donated a season's worth of coaching to the Tri to End Homelessness campaign! That's right -- for the first time, we'll be professionally coached through individual assessments and training plans! 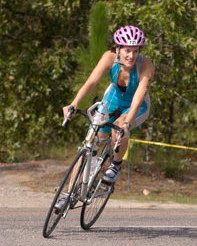 Sage is a USAT-certified coach, spinning teacher, and yoga instructor. She's also an accomplished triathlete, runner, and mom of two. She'll be helping us focus our training efforts, build speed, and incorporate yoga into Tri training. Check out her free yoga podcasts! We'll also be using an online tool to log our daily workouts. We're thrilled and inspired by Sage's generosity - and we look forward to Training Wisely in the months to come!